It's been a slow process with lots of hard work, the best part of 3 months work on weekends. A long time because I am slow, I am unfit, I was juggling weekend courses and playtime so I have not had lots of free time to dedicate to the work and I am learning as I go along. 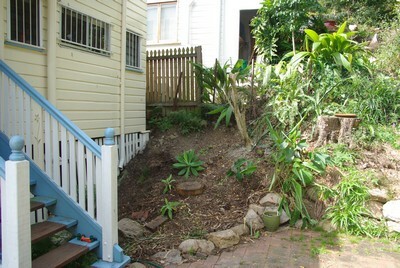 I started out by clearing the vegetation away. This went quickly as the plants did not have deep roots. That left me a bare area to start working on. I left a few plants there as I didn't have the heart to pull them out and believed that I could work around them. I wanted some vegetation to grow back afterwards under the tank to stabilise the ground. Marking out the ground was more difficult than I thought, I didn't have a helper and was working with water levels and hindered by my lack of experience. Eventually however I had the site marked out and a string guide that I could use as a reference point. I decided to dig the holes by hand and ran into my first of many problems. The ground was hard and I didn't have the right tools, I was also not fit. After purchasing post hole diggers and crow bars I was able to dig the post holes. It was hot work, often done in the full sun and I soon found that my fitness level could only achieve one hole per day. As I went on I muscled up and while I never achieved more than one hole per day I was able to do other things as well without the need to collapse in a chair. In all I dug 9 post holes. The ground turned out to be a layer of top soil on top of shale. As I dug down through the top soil I encountered lumps of shale until eventually I encountered a layer of shale that I could simply not dig through. Fortunately this was at about the depth that I wanted to go to anyway. As I was going to be concreting the posts into the ground this was in a way comforting as I know the tank is effectively resting on bed rock or at least a layer of rock so strong that it will be stable. Concreting in the first post was difficult as I had no alignment marks and reference point but it was done. For the next 2 posts I used the first as a reference and suspended the posts in their allocated place and then poured concrete into the hole until full. The picture below shows the left most and middle post hanging from the beam after I had filled the holes with concrete. If you look carefully you can see that I misaligned the middle post. I still have no idea how I did that as I measured and checked measures and calculations several times. I Started on the next row and the left hand side next. The left and middle centre posts are in place and I have roughed in the right hand side post. It is being held in place and upright ready for concreting. I have also placed the bearer on the left hand side. The lower most post of the bearer is actually suspended as I was given a tip to suspend the post at the level I wanted it rather than trying to place the post and cut the timber upright to shape and size. This worked remarkably well. Aligning all of those posts was the challenge. Even with string lines and multiple checks I never quite got it right. Maybe I am a perfectionist or there are other tricks that I have to learn. The bearers were heavy and I struggled to carry them on my own. I am guessing each one weighed close to 100Kg. Drilling the bolt holes straight and in the correct position was also a challenge with a hand drill. Still not sure what the correct procedure is. Eventually I had the bearers in place and much to my surprise remarkably level and stable. 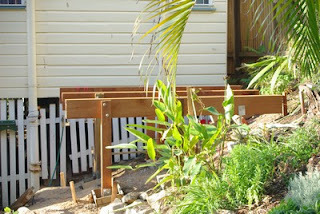 Next came the joists and I was able to rip through those, I used a wood fixing arrangement to hold them in place. This added stability and prevented them moving. The difficulty here was getting the joists straight as they all had small curves and would not sit evenly across the bearers. Eventually it occurred to me that if I arranged them so that the slight curve was up towards the middle, the weight of water in the tank would tend to flatten them out. Suddenly it was a design feature to compensate for the weight. The council regulations are that wooden tank stands must be made from hardwood, so all of this is done with structural quality hardwood. There is about $800 of wood alone in this stand. The stand is over engineered and could support a much larger tank, that is an option for the future. The current tank is 5600 litres I could easily go to 10,000 litres. 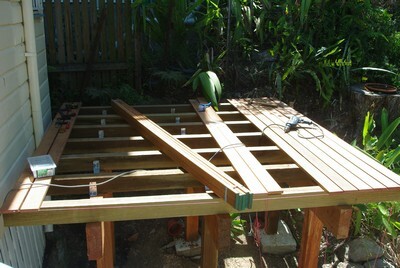 The final step was to get a deck on top of the joists. I was lucky here as I happened to walk into Bunnings one day and they had a batch of suitable hardwood decking at a good price and almost cut to size. I didn't need to transport longer lengths and cut them in situ, I could simply buy the amount I needed and trim the excess of when finished. The shot below shows part way through the process. The boards are nailed in and I predrilled each hole first and sometimes had to use a nail punch to keep them flush with the deck boards. Once nailed down I was in a rush to treat the boards with a preservative before the tank was delivered. They received several coats of a 50:50 mix of linseed oil and Mineral turps. 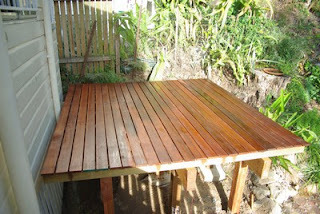 At the end of this the deck looked fantastic, if slightly sticky from the oil that had not yet seeped in to the wood. I call this a labour of love, but the reality is that it is a form of therapy and has been used to develop Deck building skills. 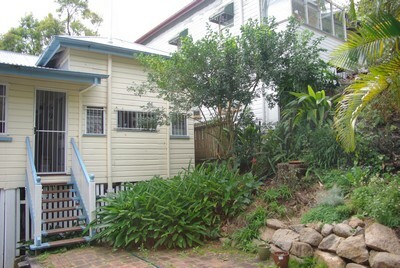 I have a dream of a large deck at the rear of my property. I know that I can do the deck now. The tank was delivered December 2nd and plumbed in the following week. Now I sit and wait for rain. This week it has been cloudless blue skies, temperatures in the 30's and no chance of rain. Storm season is behind us it is summer here. According to our local newspaper we have not had "consequential" falls of rain for 128 days. My garden and the gardens round my area are certainly showing the effect of this. Grey and straw are the primary colours, green is all but gone as a colour on the ground. The trees with deep roots still seem to be growing well however. 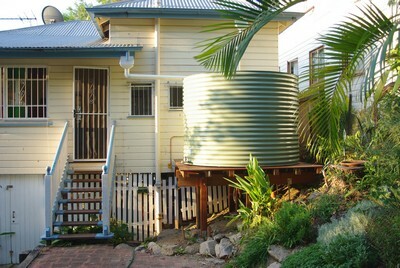 The 128 days without rain blows all of my calculations for buying a rainwater tank out of the water (if we had any). I have placed an order for an 5600 litre tank. Primarily I intend to use this for watering the garden and growing vegetables. A bit of self sufficiency. As far as the tank size goes, I am constrained by money and space. My calculations go like this. If I use 100 litres of water from it a day then it will last 56 days, I am a long way short if we have a drought and I need to rely on this water. I got the 100 litres from my current consumption. All domestic use of water plus garden use was just over 130 litres on my latest bill. The sad thing about this is that it cost me well over $100 to have water available but only $18 of actual usage. At this rate the water tank will never pay for itself. If I took an economic view of using rainwater in preference to tap water the dollars simply do not add up. The sacrifices that we make for protecting our environment. This ramble is due in part to the fact that I need to prepare either a concrete pad or a tank stand to install the tank. The concrete pad was not feasible, due to the sloping ground that I am on. So for some weekends now I have been building a water tank stand. I decided to do this myself and it is hard work. 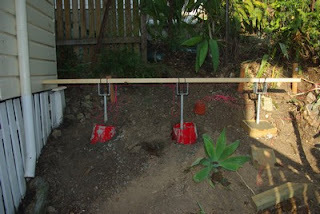 Nine post holes to dig in ground, that is extremely hard. I wanted to say as hard as concrete, but that would be an exaggeration. Still it is hard work and pushing keyboards at work is not sufficient muscle development for digging holes. In practice I find that I can dig no more than one hole a day. Possibly I am soft. But I am getting harder. Possibly I am stupid, because a professional post hole digger would have done all the digging in less than an hour. 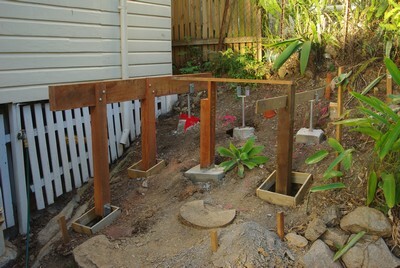 So the status is that I have 5 holes dug, 4 posts embedded in concrete, and a lot more to do. People are the only really important thing in life. Well after Maslow's physiological needs have been taken care of i.e. drinking, eating, shelter, keeping warm etc. I will explore Maslow and my need for Self Actualisation another day. In the mean time my good humour has been prompted by a 17 year old girl who told me that she misses me. I miss her too. I guess she brings out the fatherly instincts in me that I have never fulfilled. In her case I don't know. I like to think that we are both nice people even though quite different in ages. Sorry readers, my blog site has had "issues" and I have not been able to restore it to it's former glory. Yes I did have backups!!!! I will be re-configuring and restoring as I can. Maybe it's time for a new look and feel.